Eric Hammer suffered from severe Ulcerative Colitis which was diagnosed at age 2. By age 27, he had been through an unimaginable amount of medical procedures and treatments aimed at managing and improving his condition. He was very ill and often in debilitating pain. Through all of this, he met and fell in love with his soul mate Aileen Scharle. Aileen was there for Eric through it all. 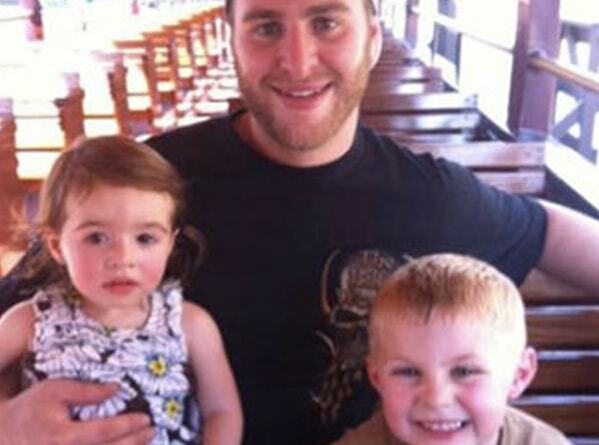 They had two beautiful children – Rowan Matthew Hammer and Julianna Bree Hammer. Eric and Aileen were overjoyed, as they had been told due to Eric’s life-long illness, they would never be able to have children. In 2012, after starting a new mediation that made a vast difference in his quality of life, Eric began to live the life he had always dreamed of – he joined a softball league, started his own business, Rowan Electric, and even took up a much beloved pastime of motorcycle riding – something he could never have taken part in while he was so very ill.
On October 1st 2012, Eric was killed in a tragic accident while riding his motorcycle – the driver of the car that hit him made a U-turn, crossing a median, and driving directly into Eric. Taken from them too soon, Eric’s family keeps his memory alive by spreading his story to others to raise awareness and save lives.